Get the chance to enjoy the walk through the night city with a charming Kitty in the Miss Kitty free slot plays. This wonderful video slot from Aristocrat has 5 reels and 50 paylines. 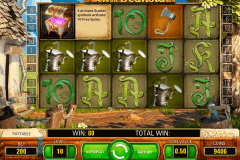 This game will entertain you with its bonus features and can make you a rich man with its 100 000 coins jackpot. The image of the nice Kitty with big green eyes and lucrative winnings make the Miss Kitty game one of the most popular Aristocrat slots online no download no registration. 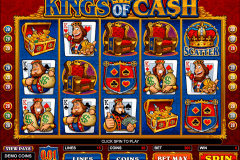 Of course, the most valuable symbol in this online slot is the image of Miss Kitty, which is the Wild symbol. In addition to its traditional functions, this Wild symbol becomes the Sticky Wild one during the free spins feature and guarantees you impressive winning chances. Every gambler knows that in free slot machine games free spins no download the special Scatter symbol will activate these free spins. In the Miss Kitty game this symbol is the icon of Moon. With its help you can enjoy up to 15 free games. As we have already mentioned, during these free spins all symbols of Miss Kitty will become stacked and can bring you a lot of coins. Moreover, when you play the Miss Kitty slot, you can get the Scatter prize in case you receive the combination of Moon and Miss Kitty images on the reels. The themes of the Miss Kitty casino game – cats, is the very interesting one for online pokies games fans from all over the world. On the reels of this well-designed slot you will come across symbols of a toy mouse, a fish, a bird, a ball of yarn, milk and card symbols from A to 9. All of them allow you to see how cats live and also bring you big money. Choose Miss Kitty game from our best online slots real money or play it for fun on your PC. Despite your choice, the great fun and good emotions are guarantees from Aristocrat casino slots.